The Ratzinger Effect / "Keep Your Eye on Rome"
"With donations to the Church from around the world almost doubling and pilgrims pouring into Rome in ever-greater numbers, Vatican watchers are beginning to reassess the two-year-old pontificate of Pope Benedict XVI and noting a positive 'Ratzinger effect." The article notes that the Vatican reports an increase in diocesan donations, record numbers of people are attending Pope Benedict’s weekly audiences and visiting St Peter’s, and increases in pilgrimages to Catholic shrines at Assisi, Lourdes, Fatima in Portugal and Madonna di Guadalupe in Mexico. I like this Ratzinger Effect. "The truth is that the Catholic Church is a bellwether for the health of Western Civilization in general—a sort of canary chanting in the coal mine of culture." "...Should the Pope be successful in his attempts to straighten the course of the Barque of Peter, it will of course be of immense benefit to his own flock. But more importantly, to the non-Catholic, it will restore the Church’s ability to function as effective a watchdog over the health of the body politic of the West as ever she did under Pius XI." "...For such as these, then, any and all of Benedict XVI’s efforts at rebuilding the Catholic ethos should be welcomed, and their success prayed for. But all of these things can bring little surprise to students of history. Very often, down through the two millennia of the Church’s history, internal reform has been followed by external persecution—itself usually the prelude to a period of triumph. In this light, July 7, 2007, may well be seen in future centuries to be as momentous a date as September 11, 2001--although, of course, one that points not toward death but rebirth. Whatever the case, keep your eyes on Rome. " There's lots of history and analysis in Taki's essay, give yourself some time to read and digest. I hope to blog more on this forward-thinking piece. Background: The Pope's "motu proprio" decree allows a wider use of the Tridentine Mass, the traditonal liturgy from the time of St. Gregory (6th century) and formalized at the Council of Trent (16th century). The Pope's cover letter in English can be read here. There won't be overnight changes, there are numerous logistical obstacles to overcome (shortage of priests, lack of training and fluency in Latin, mass schedules, etc.). The "motu proprio" decree of Pope Benedict is one of his correction factors to Vatican II excesses, a return of the Tridentine Mass to its rightful place in the Church. You can celebrate the Tridentine Mass west of Boston at the Immaculate Heart of Mary chapel at the St. Benedict Center in Still River, MA. Info and Mass schedule here. Happy Birthday, Papa Ratzi! Send Him an E-mail! 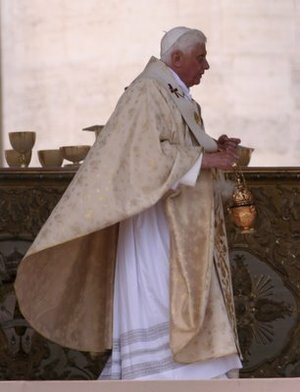 "The 80th birthday of Pope Benedict XVI is being marked in style at the Vatican. The music-loving pope will be guest of honour at a concert, and he will host a dinner for his cardinals." This photo was taken by Gerard of The Cafeteria is Closed, who attended the Pope's "birthday" mass yesterday at the Vatican. Many other excellent photos in Gerard's blog post. "It has been a surprising papacy," says John Wilkins, the former editor of the Tablet magazine. "Benedict is shy and laid-back. He is an intellectual and he listens, and gives his bishops time to breathe. You can have a conversation with him - it is not like the monologue you got from John Paul II. He is all about healing the strife between progressives and conservatives that was so sharp before, and he has made overtures to both sides." Birthday presents included a Gospel holder encrusted with precious stones, and 80 bottles of specially brewed Bavarian dark beer. 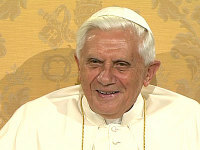 The Pope Benedict Fan Club blog has a great roundup of his birthday and two-year anniversary as Pope. Amy Wellborn did her roundup for Papa Ratzi last month at Open Book, lots of good info there too. The stamp at the top of the blog was recently issued in Germany in honor of the Pope's birthday. There's a lot of moaning about the Pope praying at the Blue Mosque in Istanbul on Thursday. He was facing Mecca, he held his hands "like Muslims do when they pray," wah wah wahhhh. Stop the cry-baby stuff already! 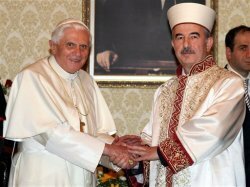 Pope Benedict was a guest in Turkey and he comported himself admirably. The Holy Father is a brave, erudite man, and he's Christ's Vicar on Earth. Have some faith in the man, for heaven's sakes! Check out the You Tube video at American Papist, he's praying to God, no more, no less. In the AP photo to the left, the Pope is standing next to Turkey's president (I believe it's Ahmet Necdet Sezer ). Full-length white camel hair, beautiful. Love the red Prada shoes peeking out! Yesterday we saw a picture of the Pope with Ali Bardakoglu, head of religious affairs in Turkey. His threads were quite fine as well (photo below). 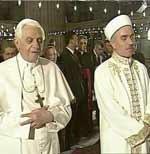 Ali made a number of blunt (one might say say rude) statements before the Pope arrived, including suggesting that Pope Benedict should not visit Turkey. I watched EWTN, the Catholic cable channel which is covering the Papal visit, for a short while today. Pope Benedict was in Ephesus today, visiting a shrine to Mary and celebrating Mass. According to local legend, Mary lived her last few years there. It was so moving! The place was packed, there were security people everywhere, but the people there were thrilled, they were singing songs and Alleluia, mothers handed their babies up to be held by Papa Ratzi, people were smiling and looking absolutely joyous. "A closely watched moment of the trip will come Thursday during Benedict's visit to Haghia Sophia, a 1,500-year-old site that was originally a Byzantine church and then turned into a mosque after the Muslim conquest of Istanbul - then known as Constantinople - in 1453. It is now a museum, and Turks would take offense at any religious gestures by the pontiff, who also plans to visit the nearby Blue Mosque. In 1967, Pope Paul VI fell to his knees in prayer, touching off protests by Turks claiming he violated the secular nature of the domed complex. In 1979, Pope John Paul II made no overt religious signs during his visit. " I'd bet big money that Papa Ratzi will pray there. As The Anchoress suggests, it's a good time to pray for the Pope and the President. Sissie's been following the Pope's visit more closely and she's weaving her usual wonderful commentary (with kitty photos, of course) on our beloved Papa. "Germans Reconsider Religion"/ Papa Ratzi Influence? "... this is the country of philosopher Friedrich Nietzsche, who infamously quipped, "God is dead." So some may be surprised at the receptivity in Germany this week to visiting Pope Benedict XVI's message: Europe needs to rethink the thesis that secularism and economic progress go hand in hand ...."
"Germany is a place where one can imagine a rethinking of this stultifying secularism and the moral relativism" prevalent in much of northern and western Europe today, says George Weigel, an American biographer of Pope John Paul II, and the author of The Cube and the Cathedral: Europe, America, and Politics Without God. "German public life has a kind of intuitive sense in the wake of WWII that you can't have a world without moral reference points, or you get you-know-what," Mr. Weigel explains. He points to the recent shift of Jürgen Habermas, one of Germany's foremost philosophers, as evidence of the potential for a rethinking of the public role of religion. A professed secularist who has spent nearly half a century arguing against religiously informed moral argument, he made some arresting statements in his 2004 essay, A Time of Transition. "The fact is this: that the modern world, with its modern movements, is living on its Catholic capital. It is using, and using up, the truths that remain to it out of the old treasury of Christendom." Is it me or is this Pope in the news all the time? Never mind the coverage of controversial matters (like the lecture at Regensburg), which I wrote about here and here. Pope Benedict gets mainstream media coverage when he named four new saints (including two nuns), confimed that his trip to Turkey next month is still on (no scaredy-cat he), and let slip that he's working on bringing back the Latin mass. I think it's kind of cool that Papa Ratzi is in the news so much. And not just for globe-trotting a la Pope John Paul (may his soul rest in peace), but for significant doctrinal reasons. The world needs him, and he's coming through. I never expected this level of engagement with the wider world from an 83-year old German theologian. Papa Ratzi: "We Have a Positive Idea to Offer"
"...in the western world today we are experiencing a wave of new and drastic enlightenment or secularization, whatever you like to call it. It's become more difficult to believe because the world in which we find ourselves is completely made up of ourselves and God, so to speak, doesn't appear directly anymore.... Humanity has rebuilt the world by itself and finding God inside this world has become more difficult. This is not specific to Germany: it's something that's valid throughout the world, especially in the West." "...I am very happy there are young people who want to be together, who want to be together in faith and who want to do something good. The tendency to do good is very strong in young people, just think of the many kinds of volunteer work they do....Go ahead! The world needs this desire to do good! Then another message might be this: the courage to make definitive decisions! Young people are very generous but when they face the risk of a life-long commitment, be it marriage or a priestly vocation, they are afraid. The world is moving dramatically: nowadays I can continually do whatever I want with my life with all its unpredictable future events. By making a definitive decision am I myself not tying up my personal freedom and depriving myself of freedom of movement? Reawaken the courage to make definitive decisions: they are really the only ones that allow us to grow, to move ahead and to reach something great in life." "...we have to witness to God in a world that has problems finding Him, as we said, and to make God visible in the human face of Jesus Christ, to offer people access to the source without which our morale becomes sterile and loses its point of reference, to give joy as well because we are not alone in this world. Only in this way joy is born before the greatness of humanity: humanity is not an evolutionary product that turned out badly. We are the image of God." "Christianity, Catholicism, isn't a collection of prohibitions: it's a positive option....We've heard so much about what is not allowed that now it's time to say: we have a positive idea to offer, that man and woman are made for each other, that the scale of sexuality, eros, agape, indicates the level of love and it's in this way that marriage develops...and then the family, that guarantees continuity among generations and through which generations are reconciled to each other and even cultures can meet... it's not a Catholic invention that man and woman are made for each other, so that humanity can go on living: all cultures know this." "There's a great danger that these places where Christianity (Middle East) had its origins will be left without Christians. I think we need to help them a lot so that they can stay. .....Europe definitely became the center of Christianity and its missionary movement. Today, other continents and other cultures play with equal importance in the concert of world history. In this way the number of voices in the Church grows, and this is a good thing." What role does humor play for a pope? What a great pope he is! Learned, compasionate, a great moral thinker and humanist. I hope he makes it to New York next year, as earlier rumors suggested. More pope pics here. Hat tip to The Cafeteria is Closed. Today marks the feast day of St. Benedict of Nursia, the founder of Western Monasticism, who's also the namesake of our present Pope, Benedict XVI. Benedict was born in Umbria, central Italy, around 480. "As a young man Benedict was sent to Rome for studies but left after a short stay, desiring to dedicate his life to God. He went to live in an isolated place near Subiaco, not far from the ruins of Emperor Nero's summer villa, about fifty miles from Rome. Today the cave is the celebrated shrine called "Sacro Speco" (The Holy Cave) and is one of Europe's most beautiful sanctuaries. At Subiaco, Benedict lived a life of solitude and prayer for about three years with the support from a monk named Romanus. Benedict's time as a hermit was interupted for a short period when he became the superior of a group of unruly monks. Ultimately unhappy with his guidance, they tried to poison him. He then withdrew to the cave at Subiaco once again. Eventually, Benedict's sanctity attracted disciples and in time, twelve small monasteries were established around Subiaco, with Benedict as the spiritual father of them all." "Around the year 530 Benedict left Subiaco with some of his disciples for Monte Cassino (site of former temple to Apollo), halfway between Rome and Naples, where he began a single, close-knit community on a mountain top. There he remained until his death around the year 547. Is was at Monte Cassino that Benedict completed his "Rule for Monks" ...Today, the "Rule of Saint Benedict," as it is commonly called, is considered one of the most important factors in the development of Christian Europe." "Even though he lived thus sequestered from the world, Benedict, like the Desert Fathers, had to struggle with temptations of the flesh and the devil. One of these struggles is described by Gregory. 'On a certain day when he was alone the tempter presented himself. A small dark bird, commonly called a blackbird, began to fly around his face and came so near to him that, if he wished, he could have seized it with his hand. But on making the sign of the cross, the bird flew away. Then followed a violent temptation of the flesh, such as he had never before experienced. The evil spirit brought before his imagination a woman whom he had formerly seen, and inflamed his heart with such vehement desire at the memory of her that he had very great difficulty in repressing it. He was almost overcome and thought of leaving his solitude. Suddenly, however, with the help of divine grace, he found the strength he needed. Seeing near at hand a thick growth of briars and nettles, he stripped off his habit and cast himself into the midst of them and plunged and tossed about until his whole body was lacerated. Thus, through those bodily wounds, he cured the wounds of his soul." Never again was he troubled in the same way." I bet! Ouchie!! I include this not because it's the most important thing about St. Benedict, but because in our modern world, these stories are no longer told. We're embarrassed by the passions and excesses of the early Christians, we only want to hear the sanitized history. But all religions have some form of mortification of the flesh, some method of the spirit transcending the body, be it lying on a bed of nails, fasting for a month in Ramadan, or sitting in a sweat lodge. We don't roll around in briar patches or put rocks in our shoes anymore, but we don't need to deny that it happened either. Later in Benedict's life, he discouraged extreme austerities that were damaging to the health. "Western monastic houses inspired by Benedict's Rule helped preserve the ancient learning that wold otherwise have disappeared from the Continent, opened schools that created Europe's educated class, developed the exquisite music we know as Gregorian Chant (whose notation led to modern musical notation), and - most importantly - created a wide variety of beers, wines and liqueurs we still enjoy today." Some other titles for St. Benedict are "Messenger of Peace, Architect of Unity, Teacher of Culture and Civilization, Father of Western Monasticism, Herald of the Christian Faith, and Father of the Whole of Europe." Big shoes for our Papa Ratzi to fill. He can do it. The Anchoress had an inspirational write-up about St. Benedict last year, link here. 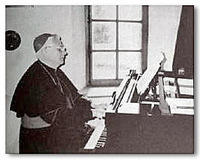 Thanks to Sissy for finding this great photo of then-Cardinal Ratzinger playing Mozart. Pope Benedict to Come to NY in 2007? There's rumors afoot that Pope Benedict is visiting New York City in 2007. I'm so there. "The daily La Stampa reported on June 2 that the Vatican is weighing a papal voyage that would include stops in New York, Caracas, and Mexico City early in June 2007. Pope Benedict could go first to Venezuela, for a visit that would show his support for the Catholic hierarchy there in its confrontation with President Hugo Chavez..... Next the Pope could head to Mexico, for a visit to the shrine of Our Lady of Guadalupe.....The final stop under consideration would be New York. Pope Benedict would reportedly like to pray at "Ground Zero," the site of the terrorist attack of September 11, 2001."